Armenia is full of ancient monasteries in the most beautiful and remote locations. Unfortunately these beautiful locations are difficult to get to by public transport. As an independent backpacker I had to make some tough decisions. Either travel by public transport, but missing out on some of Armenia’s most beautiful monasteries or saving myself a lot of time and effort by going on a tour. Luckily there are plenty of companies offering cheap tours. I choose One Way Tour, because they also had two hostels in Yerevan with good reviews. One Way Hostel was an interesting mix of travellers. In my dorm was an iranian student and several Filipino girls awaiting their visas for work in the middle east. It didn’t take long for them to open up to me. One was dreaming of driving the Karakoram highway in Pakistan on her motorbike and another one wanted to see snow for the first time in her life. I felt at home in One Way Hostel and it was easy to make friends here. I was still a bit hesitant about the tours. For me travelling by public transport is the best way to get to know a country and get into contact with the local population. I felt I might miss out on that by going on tours where I will likely meet more other tourists from my own country than Armenians. In this case, I was very wrong. First of all, One Way Tour is not only for foreign travellers, but also for Armenians themselves who would like to see more of their own country. People from Yerevan love to go out of the city and see their monasteries, and with limited public transport available, they also make use of tour companies like One Way Tour. Second, the tours would not only visit the famous highlights of Armenia, but also other less known places. Local secrets that I would never have known about. In the end, One Way Tour offered me a much better insight into Armenia than if I would have travelled by myself. The guides were all excellent and enthusiastic about sharing the stories of Armenia’s history with us. It was also very easy to meet other Armenians who were happy to explain even more about their rich culture. Of course I wanted to see Armenia’s most fabled monasteries and with One Way Tour I saw more then I could ever imagine, but they also showed me Armenia’s hospitality and friendliness. My first tour was to the monasteries of Khor Virap and Noravank with an additional stop in Jermuk. Jermuk is a town in the hills surrounded with forests and mostly known for its healthy mineral waters. We had a small group of people and I was the only foreigner that day. The Armenian people included a couple that celebrated their 35th wedding anniversary. During lunch my fellow travellers shared their homemade snacks with me. At the end of the day I wasn’t sure whether it was Armenia’s friendy people that were more impressive or the monasteries. The next tour was to Tatev monastery, the Sheki waterfalls and a sheep shearing festival with traditional music. As the day progressed and more beer and vodka was consumed, the emphasis was more on dancing than on shearing the sheeps. The best performance was maybe the drunk farmers who tried to gather their sheeps back in the truck. It was a long day, but this was the most beautiful part of Armenia. Tatev monastery is on a hilltop surrounded by mountains and the best way to get there is by a ropeway that is now the longest ropeway in the world. The 4 hour drive from Yerevan is through green rolling hills with yellow wildflowers and patches of snow in the distance. I enjoyed every minute of the journey looking outside to the scenery. Garni is the only pagan temple that is still left in Armenia from the time before Christianity. It is not far from Yerevan and close to the Geghard monastery. Despite having seen so many monasteries already I was still impressed by both. Garni looked more like a Greek temple to me and Geghard’s location in the mountains was stunning. After a delicious lunch of Armenian dolma we would visit Tsaghkadzor. Like Jermuk, another town with health spa’s, but in winter also a busy ski resort. For now, our main aim was to visit the Kecharis monastery and enjoy the fresh air in the mountains. My last tour was to Lake Sevan and Dilijan. Both known for their natural beauty. 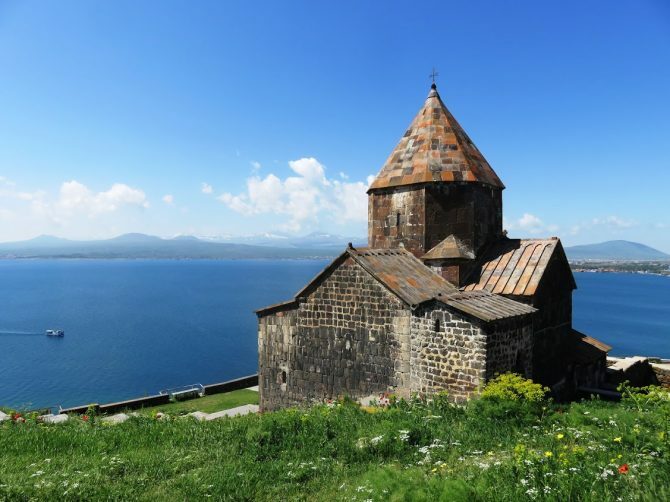 Lake Sevan is one of the largest fresh water alpine lakes in Eurasia. There is of course another monastery here with a beautiful view over the lake. Once we passed the Sevan Pass the road became very scenic with high mountains. People were selling fish, mushrooms and corn on the side of the road. Around Dilijan we visited two more beautiful monasteries called Goshavank and Haghartsin. Again the location was as stunning as the monasteries itself. The trip ended at Parz lake. A popular picknick spot for Armenians, with few tourists. Dilijan is also called the Switzerland of Armenia. I felt I could easily spent a week here doing hikes in the area. With this trip I really felt I just experienced the tip of the iceberg if it comes to Armenia’s natural beauty. Not many people know I have a secret childhood passion for astronomy. I used to have my own telescope and always wanted to become an astronomer. Unfortunately I wasn’t very good in mathematics so when the time came to choose a study I followed my other passion to learn more about people and different cultures in the world. Still, whenever there is an astronomy event somewhere I feel something twinkling in my brain. And so it did when I read One Way Tour was offering a tour to the Byurakan Astronomical Observatory. What else is more exciting than visiting an old Astronomical Observatory in the mountains of Armenia? We left when it started to get dark and we were lucky, because we had a clear sky. The astronomer in charge showed us the moon, Saturnus and Jupiter. It was a short tour, but I could not have been happier. One Way Hostel has two branches in Yerevan. Both have an excellent location. The Belyakov hostel (5 Belyakov) is just behind the Republic square and a 5 minute walk from the Republic Square Metro station. From the exit of the Metro go towards Sakharov square, cross the street and then take the first alley on your left. Belyakov has a female dormitory and a male dormitory. The Tumanyan hostel is more close to the Opera Theater. It is smaller than Belyakov with a large and spacious mixed dormitory. It’s five stairs up in a building, but you will be rewarded with a nice view. I stayed in both hostels and was very happy with either of them. Great staff, nice breakfast and all the facilities you need. One Way Tour offers a great variety of one day or multiple day tours throughout Armenia and Georgia.They also have tours to Nagorno Karabagh. You can check their websites for their regular weekly tours, but also keep an eye out on special tours. They offer tours to local festivals such as the dolma, raspberry and mulberry festivals or sheep shearing competitions. Armenia is one of those off the beaten track destinations you don’t hear much about. But it really looks like a great place to explore. And good advice to join a tour to get around. It’s also always better to go with some local guides. I’ve never really thought about visiting Armenia but it looks like a wonderful place! I love going on group tours because I really enjoying meeting new people and finding out about the history and culture from knowledgeable guides. Great choice! I really enjoyed reading your story. And loved the first picture with an old woman! One of those pictures you usually remember for a long time. Armenia was never a country I had any ideas about to be honest, but from your experiences, it sounds amazing. The pictures are stunning and I think you made a great choice with the guided tour, although I do understand your initial struggles with that. Missing out isn’t really an option though 🙂 safe travels to you! Armenia is a tiny country, oft-forgotten by travelers ! It’s an ancient and mystical land, and a country still unspoiled by the crowds of mass tourism. It’s a country with a rich history, and a dark past. I think you need to take your time wandering through its monasteries and temples, and enjoy them in their silent splendor. Definitively on my bucket list, 🙂 ! Beautiful place for outing. One can plan their tour easily with this beautiful place with their family members. Enjoy this trip to make your weekend more exciting.